Can you pass this NHL goal horn quiz? You guys made it happen. It’s the NHL GOAL HORN QUIZ! After the two-week goal of 10,000 likes on the last quiz was met in... four hours, the BarDown Squad is giving the people what they want. Emilie, Corwin, Luca, Eric and Jesse (yes, that’s a child-size Leafs T-shirt) are tackling goal horns from around the NHL, with a bit of a twist this week — instead of eliminations, this one’s a best-of-ten. Everyone gets to the final boss! 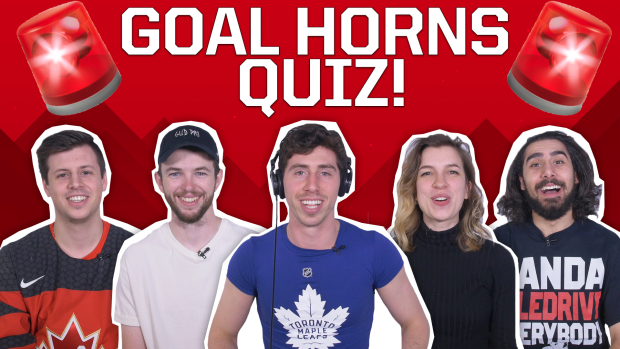 Without further ado: Here’s your goal horn quiz! So, how well do you know your horns? Probably fewer than Emilie, who was eight for her first eight goal horns to win her first quiz of the season. You couldn’t name a better quiz to win!